OPA Calls "Online" Irrelevant, Becomes DCN: Focus Now On Digital "Content"
Fishermen's News is aimed at the commercial fishing industry on the U.S. West Coast from the Bering Sea off Alaska to San Diego, as well as the Hawaiian atoll. They focus on the business and operational issues that face small boat fishermen, dive fisheries and shellfish growers, along with the freezer/longline, crab and catcher-processor fleets of the North Pacific. 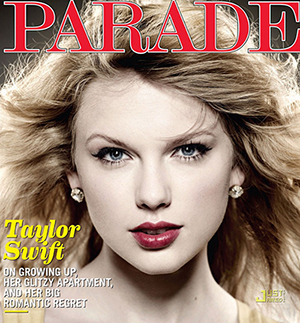 Parade magazine, one of the oldest and largest-circulation magazines in America, has been sold to Athlon Media Group. Terms of the deal were not disclosed, but Athlon said it was acquiring Parade and sister Sunday supplement magazine Dash along with "associated digital assets" from Parade Media Group LLC. Parade and Dash join Athlon's lineup of newspaper-distributed magazines, including American Profile, Relish, Spry Living and Athlon Sports, all of which have a combined circulation reach of 38 million-plus via 1,600 newspapers. The deal will add Parade, the largest-circulation magazine in the U.S. at 32 million households, and Dash, a food and family magazine with 8.8 million circulation, to the Athlon portfolio. Parade.com and DashRecipes.com are also part of the acquisition. Parade magazine is distributed weekly by more than 700 newspapers, including the Atlanta Journal-Constitution, Baltimore Sun, Boston Globe, Chicago Tribune, Dallas Morning News, Los Angeles Times, Miami Herald, New York Post, Philadelphia Inquirer, Minneapolis Star Tribune, San Francisco Chronicle, Seattle Times and Washington Post. Dash magazine appears monthly in more than 150 newspapers. Both publications are distributed to predominantly A & B county DMAs. "The opportunity to acquire these marquee brands is very exciting," said Chuck Allen, President and CEO of Athlon Media Group. "Their titles have different marketplace distribution than our other publications. Parade and Dash position the company to have the most effective and efficient advertising and retail activation reach of any media group across the U.S."
Focus Now On Digital "Content"
In a move that is symbolic of the fundamental shifts taking place among big digital publishers, the Online Publishers Association has changed its name to Digital Content Next. The trade association, formerly known as the OPA, says it is making the move because there are broader issues confronting how its members distribute content and monetize it from marketers and consumers, but the simpler truth may be that the words "online" and "publishing" may have become passe, and less than relevant in an era of media ubiquity. "Our members wake up every morning thinking about how to create great content experiences and monetize them," stated Jason Kint, who succeeded long-time OPA CEO Pam Horan in May. Kint previously was Senior Vice President and General Manager of CBS Interactive's sports division. "With this reset, we will be working to push the industry forward to its next level of development," added Martin Nisenholtz, the former long-time New York Times Digital executive who founded the OPA. Going forward, the group said it will focus on issues "ranging from net neutrality to revenue innovation to privacy." Kint conceded that the word online "doesn't feel as relevant as it did 13 years ago with digital integrated into every corner of our lives," and said the repositioning of the trade group is designed to be more "forward-thinking." We believe in an open Internet in which consumers and marketers may directly associate with our brands. We are aware of the many choices of consumers across more and more platforms. We will honor their trust in our brands and relentlessly advocate for their respect. We are aware of the many choices of marketers across more and more platforms. We will shine a light on the falsehoods and misconceptions in the modern digital marketplace in order to defend members' businesses, particularly in the areas of ad tech and cross media attribution. We will have a seat at the table representing trusted first party relationships in any discussion among advertisers, policy makers and the press. We will create a trusted forum among members to share strategic insights, best practices and tactics in order to ensure a vibrant original content marketplace. 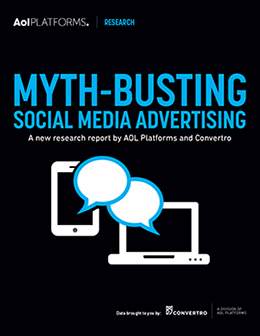 According to a new study by AOLplatforms, social media has emerged as one of the most popular marketing tools to reach consumers, with companies like Twitter, Pinterest, Facebook, LinkedIn, YouTube and others vying for advertising dollars. As with other marketing channels, it has become vital for marketers to understand the absolute value of their investments in social channels, or change tactics accordingly, says the report. To understand how social media channels contribute to an advertiser's efforts, the study leveraged Convertro's multi-touch attribution technology to analyze all social media exposures that occurred in Q1 2014 across its entire client base. To reveal true user action, this report is based on real world, third-party customer data rather than relying on survey data, which can be unreliable. Social media provides significant impact on a customer's path to purchase and strongly influences buying decisions. Spending on social media allows marketers to reach incremental audiences that they may not necessarily get through TV and other media channels. However, it's important to understand how a brand's presence on those sites, from a paid and organic standpoint, affects the path of a consumer's journey towards purchasing a product, says the report. The report shows that social media is much more likely than any other marketing channel to serve as a middle touchpoint (87%) along the path to purchase, which is an important part of customer awareness and consideration of a product. In the analysis, YouTube appeared to be the strongest of the social networks at introducing new products (18%) and driving conversions (14%). This is a good indication that video is an important format for advertising to potential customers. Facebook came in a close second place in terms of introducing new products (11%) and closing sales (10%). 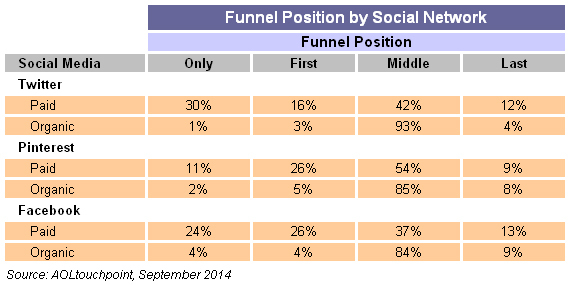 It's possible to quantify this impact by comparing organic versus paid social media conversion rates. Marketers that allocate ad spend to social channels see a nearly 25% lift in the number of sales generated by advertising, compared to sales generated by organic, non-paid marketing touchpoints. As Facebook, LinkedIn and others adjust with their algorithms for displaying user content, the report feels that the ratio "sales generated by organic versus paid" will continue to skew further towards paid social advertising, allowing marketers to control what is shown, when and to whom. While some consumer surveys have shown advertising on social to have a negligible impact on actual sales, and therefore relegating the sites to being more brand awareness, the real-world data collected in this study indicates the opposite, says the report. If you're a marketer holding off on paid ads on Facebook and Twitter because your earned media is performing well enough, think again says the report; your conversion rate for paid social could be dramatically higher. Mail distribution is defined as individual copies (five or less) delivered to a single home or business via USPS or other governmental postal service. Mail distribution may either be paid or free. For the audit, please provide Statements of Mailing validated by the USPS or other postal service for each issue. Proof of payment for delivery (copies of cancelled checks, bank statements, credit card statements, etc.) is also required. If you use a contract or 3rd-party mailer, you'll need to provide original invoices from the company showing the total number of copies mailed per issue and proof of payment. 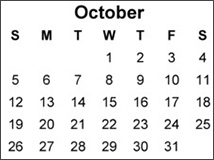 If you mail directly from your office using 1st-class postage, make sure to maintain a log that includes the issue date, meter start/stop totals, total number of copies mailed and the cost. These records and proof of payment for postage are required for the audit. If you have paid mail subscriptions, please provide a subscriber file or list showing the name of the subscriber, address, amount paid, date paid and expiration date. We will request verification of subscriber payment (deposit slips, copies of checks, etc.) for a sample number of subscribers during the audit. The subscriber list should clearly indicate paid vs. free subscription status if you offer both types of distribution.